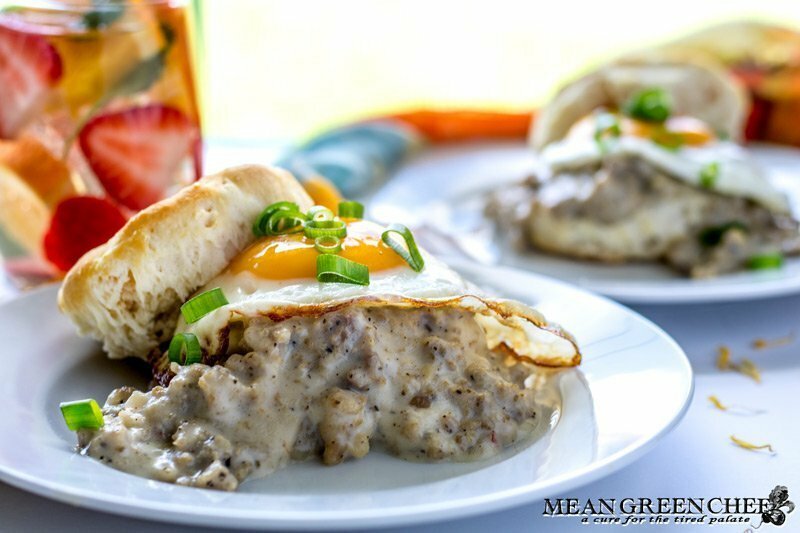 Easy Country Sausage Gravy, served over fluffy buttermilk biscuits and topped with a bright sunny side up egg, a fast indulgent breakfast ready in 20 minutes flat! I was in a pinch last weekend and needed breakfast fast we had a million things to do. Craig had been asking for sausage gravy for weeks, it was the perfect answer and of course, scoring points for an anticipated breakfast can’t be a bad thing! A considerable amount of Southern cooking originated from being broke! Wild pigs were numerous and milk and flour were inexpensive, giving us the treasured deep south recipe known as Biscuits and Sausage Gravy. Today southern cuisine is honored around the world. This breakfast can be dished up with or without your favorite style eggs or all by itself spooned over piping hot biscuits or breakfast potatoes. It’s the perfect option to serve for a big gathering of hungry morning guests! BUT seriously look at those eggs, yum! How do I make sunny side up eggs? Heat the butter in a medium heavy-bottomed sauté pan over low heat, until slightly shimmering, about 3 minutes. Crack the eggs into separate ramekins and then gently empty each to the sauté pan. Cover with a lid and cook 2 minutes, uninterrupted, until the whites are completely set but the yolks remain runny. Slide the eggs out of the pan on top of the hash and serve immediately. What kind of sausage should I use for biscuits and gravy? You definitely want to buy a good quality breakfast sausage. I suggest Tennessee Pride (this is not an ad). I’ve served their brand for as long as I’ve been cooking southern dishes, the flavor is perfect and the fat is minimal. You’ll find it in the breakfast meat section, sold in tightly wrapped rolls. You can even play on the flavor by using the hot or sage varieties. How do I reheat leftover Sausage Gravy? Warm over low heat in a heavy-bottomed saucepan on medium-low heat, add a little milk as you go to thin the gravy to the desired consistency. I served these up with a cold glass of strawberry, orange, basil water. Totally refreshing! After the sausage has browned nicely, add the flour directly to the pot. Stir and allow the flour to melt into the sausage, as it cooks the mixture will have a slightly nutty aroma and the flour will start to brown. This adds a ton of flavor and genuine southern flare! Then you can start adding the milk or cream which will thicken the gravy. Be sure to use whole milk or cream in this recipe. 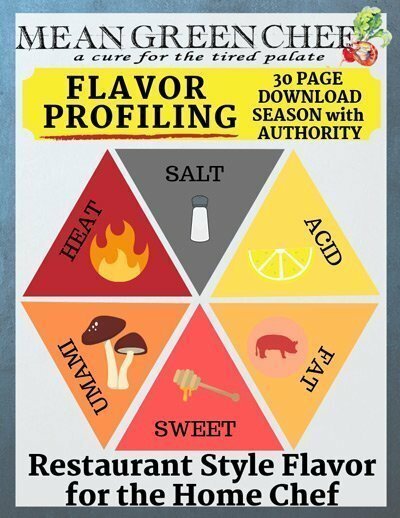 Remember gravy is all about the flavor and fat equals flavor! Obviously, this is not an every weekend breakfast so go ahead and indulge a little. Skim milk or milk substitutes will not produce the same delicious results. Don’t forget the freshly cracked black pepper it’s a major component of this dish, add coarse Kosher salt after cooking to taste. Heat a heavy-bottomed Dutch oven over medium-high heat, add sausage; cook 10 minutes until crumbled and browned, stirring occasionally with a flat bottomed wooden spoon. Add the flour to the sausage and stir until the flour is combined and begins to brown. Pour in the milk, stir and cook about 5 minutes until thickened and bubbling. Add the pepper and taste for salt, then season accordingly. Serve immediately over hot biscuits or potatoes. Can be stored in the refrigerator in a tightly sealed container about 2 days. Looking for more breakfast recipe inspiration? Then you make like these creations too! We 💙 LOVE 💚seeing your creations! So don’t forget to tag us @meangreenchef or #meangreenchef so we can see all your great shots! This is a great simple way for a hearty meal. We even have this for dinner sometimes as it is a fast easy yummy recipe. I always like to try different versions of a Sausage Gravy. I am excited to make this. Hi, Lisa! 🙂 We love breakfast for dinner sometimes and this fits the bill for sure, thanks so much for stopping by to check it out! This recipe is making me hungry! It looks so good! I love sausage gravy. Thank you for sharing! Never used cream for my gravy, only regular milk! I will have to try it with the cream and see the difference!!! The sausage gravy looks great! I’m about to go out for brunch, and wish I could order this. I love the strawberry-orange-basil water, both as an inspiration to make flavored waters but also how beautiful it makes the photos! Always love your recipes. Hi, Beth!! 🤗🤗🤗 Oh, brunch sounds lovely right about now, we are getting ready to do a salad shoot. Don’t you just love the color of the strawberry basil water? It’s a great way to spruce up brown food lol and it’s totally refreshing and delicious! Sausage Gravy is the one food that I could eat everyday to survive!! Going to try this recipe as soon as I get the ingredients, Thanks!! I pinned this, it looks phenomenal for a guilty Sunday brunch. Yum! Nothing beats the comfort of some biscuits and gravy on a Sunday morning! I can’t wait to give this one a try next weekend! I could go for a big bowl of this right now!! Thanks for sharing.